The red carpet is no time to play it safe, especially not when you're the "cool girl" of the music industry. And play it safe, she did not: Beyonce's little sis Solange Knowles' 2015 Met Gala dress was something else entirely. Other-worldly, even. The singer's dress, which was made by British fashion designer Giles Deacon, was definitely far-out from your boring old black red carpet dress. I really hope she doesn't have to sit down tonight, though, because the structure of this dress looks like it'll be a little challenging to work with. It's basically like a giant disc. I'd also recommend that she watch out for her face, because if she's anything like me (although, granted, she's probably not) she could be hitting herself left and right. I don't even know how to describe the style of this dress — A-Line? Bell? Princess? Nope, nope, nope. It's probably just indescribable by common terms, so we'll just have to explain it based on these 7 things it bears a striking resemblance to. And who knows? Maybe Solange will be responsible for bringing one of these things into the world's fashion vocabulary. I can see it now — the frill-necked lizard dress. The dress does have a very ocean-y vibe, come to think of it. 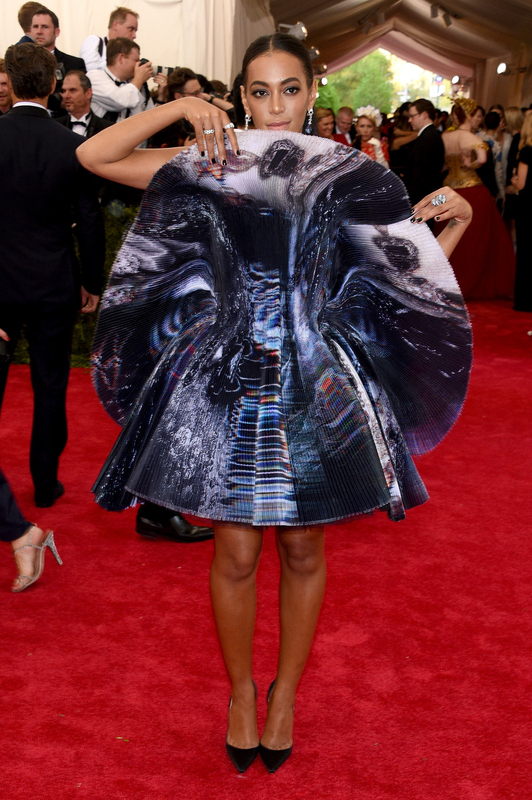 Maybe Solange is hiding Spock behind there. Talk about wearable tech, amiright? Anddd we're back to the deep blue sea. Maybe she needs a field trip to the aquarium. There's definitely an astrological feel to the shape of this dress. You know, those things that you used to think were priceless in elementary school?